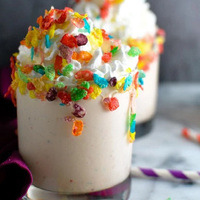 A creamy vanilla milkshake with Fruity Pebbles whizzed in, topped with a dollop of whipped cream. Tasty enough as a shake-n-vape, but gets much better after a week when the Fruity Flakes calm down and the Hazelnut, VBIC & Vanilla Swirl blossom into more of a malted vanilla milkshake. Willy hears ya' about the sugars in FW Fruity Flakes. Willy don't care. This recipe is the property of RuntDastardly and released under the CC Attribution-NonCommercial-Sharealike 4.0 license. You may not copy, derive or commercialize this recipe without following the terms of this license or the explicit permission of the creator. December 30, 2016 : Version two is on the way for the new year! This one addresses the missing berry note. Stay tuned! Delicious....will be a regular mix! This recipe gets sooo much better with some time..It was just delicious. The milky creams are perfect. Great great job.. Fruity Flakes kinda hits me in the back of the throat but still, I enjoyed this quite much. Thanks bro. Very good recipe! The mix of the creams in this are so good. The Hazelnut gives all the creams that nice thick mouthfeel. I know Fruity Flakes is one of the flavors on the fructose list. But that sweetness is so addicting and I can't stop vaping this. Great job! Cereal vapes aren't my bag, but this right here? This is the ticket. Creamy and sweet with just the right amount of citrus. I could vape on this milky delight all week long. Most impressive! This stuff is gooood! 👍👍🙌😆 Just mixed up a batch last night and tried it this morning... Hell yeah! Definitely good as a shake & vape... Can't wait to see how much better it gets in a couple days/week... If it lasts that long... Definitely one of the better cereal vapes I've come across! Thanks!